As in all Willats’ projects, The West London Social Resource Project aimed to extend both the concerns of art and the social territory in which it physically operates. It took place within four residential areas – Project Areas - in West London over 6 weeks. Each of the four areas represented different social groups. After local publicity, Project Operators called on people in the four areas and introduced the project to them. Those who agreed to participate were given a copy of the West London Manual and the use of these booklets were explained to them. The Manual contained a series of pages of visual cues and objects selected from the four Project Areas alongside sheets which asked the participant to respond by describing the associations or connections they had with different objects, or with their wider environment. There were also Day Sheets which needed a more thoughtful response to questions which started with describing their home environment – ‘Draw / describe / make a plan of what is on your living room mantlepiece’ and then moved on to the way they saw issues within their wider social environment – ‘Draw / describe / make a plan of your ideal form of transport’. 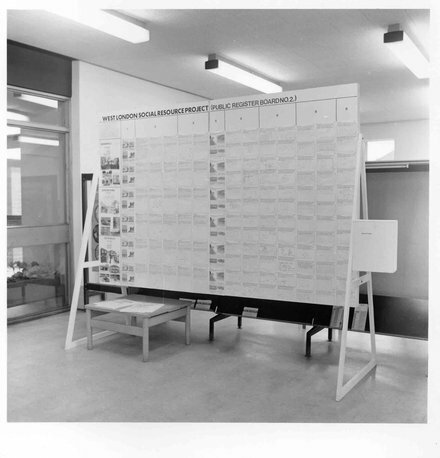 Copies of all the individual participant reponses from the Manuals were collected together and shown on large Public Register Boards in the library in each locality, enabling a wider public to look at the perceptual responses and to compare these to their own. Following this a further process was to distribute a Re-modelling Book to participants. This contained more complex questions than the Manuals which focused on a re-modelling of their household environment and their immediate neighbourhood, for example: ‘What do you see as the ideal social structure for your neighbourhood?’ This second set of responses were also shown on a new set of Public Register Boards, this time there was also a ballot box so people could vote for preferred models. From this Final Models were then produced and displayed. At the same time, Willats had initiated The Centre for Behavioural Art in Gallery House, Exhibition Road, London. Gallery House was set up by Rosetta Brooks and Sigi Krauss and was a centre for the artistic avant-garde. Interest in The West London social Resource Project led to the presentation of a Public Monitor about the projectbeing situated on the ground floor of Gallery House, as it was seen as the ideal vehicle for showing those closely involved in the contemporary discussions about new practice informing them of what was currently taking place out in the suburbs of West London.The original Public Monitor measured 16 feet long by 8 feet wide by 8 feet high, and was a free standing self supporting structure, painted white, taking the form of a room inside a room. 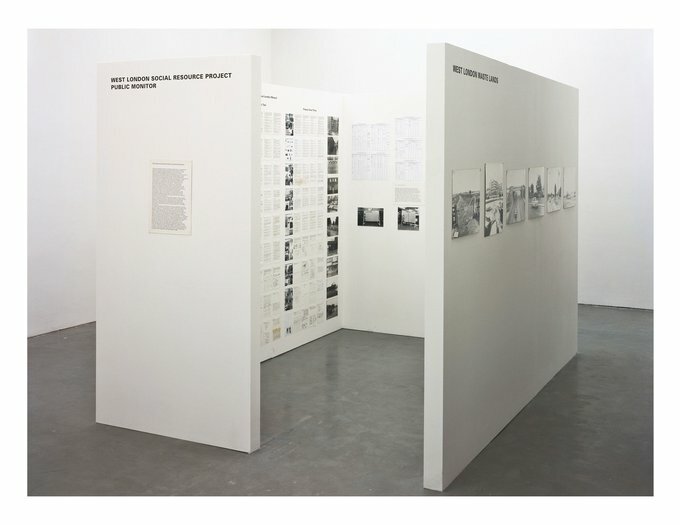 Around the outside of the Public Monitor were displayed a series of black and white photographs of the waste land areas that separated the urban built up areas and proliferated all over outer West London. These waste lands provided an important vehicle for people in those areas to escape from the determinism of the world around them. i had noticed these waste land areas when driving around West London on an initial search for suitable Project Areas.On the inside of The Public Monitor were photographic documentations of the four Project Areas, maps, flow diagrams of events, and photographs of the various manifestations of the work’s implementation, such as the Public Register Boards in the libraries etc. 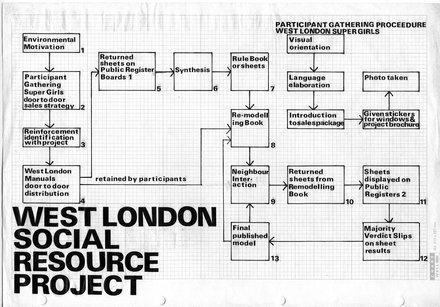 The Public Register was updated as the project in West London went forward, and could, and was visited several times by people, becoming a catalyst for those interested in the discussions of social meaning and relevance of art practice to contemporary society.